The old fashioned. Photo by Donna Turner Ruhlman. Phew! I’m exhausted from all the amazing and powerful energy generated by the food fascism post! Oy! Today’s Friday cocktail hour is one the oldest and simplest on record. In this era of high-end mixology and complex recipes involving expensive aperitifs and liqueurs, well unless out in the stratosphere at Aviary, I like my cocktails simple. 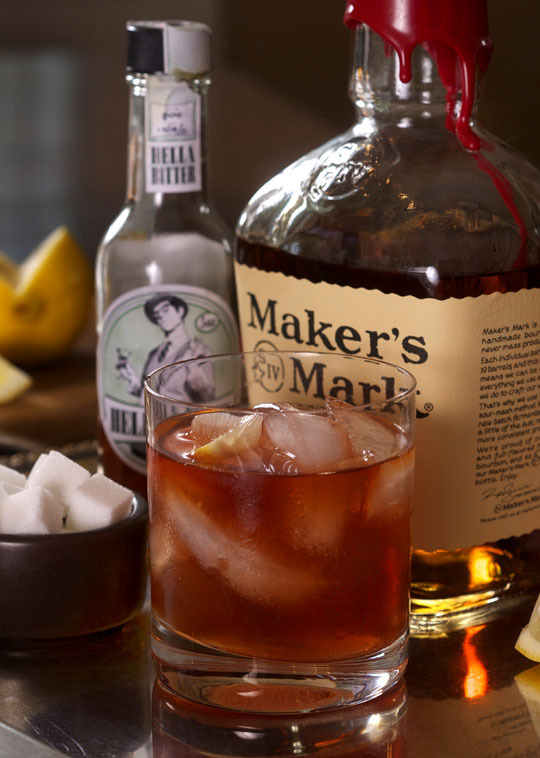 The Old-Fashioned is just that: American whiskey, sugar, bitters, over ice with a twist. All there is to it. With the range of bourbons and bitters now available, the drink itself can vary wildly and well. So even though this is every bit as simple and satisfying as a martini, it’s infinitely more complex. A martini is clear and clean, an ice pick. The Old-Fashioned is complex, caramelly, bitter, sweet, citrusy. Because there are only three main ingredients, nuance is everything. Choice of bitters (I prefer citrus), amount of bitters (I like plenty), sugar-bitter ratio (I like it even-steven). Traditionally, this is garnished with a twist, but I like an actual squeeze of lemon. It’s up to you, and the hour you’re having it. Before dinner? Easy on the sugar and bitters; after, the sugar and bitters are desired. Again, simplicity and nuance is what I love. Thanks, Paulius, that’s what it’s all about. And thanks, Brad. Additional reading on the Old-Fashioned from Slate. Herewith, one of the simplest, oldest, and most satisfying cocktails on record. Place the sugar and bitters in a rocks glass and muddle and stir to get the sugar disolving. Add the bourbon or rye and stir. Add ice and a squeeze of lemon (or a twist or orange zest). My post on Chicago, Xoco and chocolate. Mike Ryan and Jacques Bezuidenhout make the Sable’s bar in Chicago amazing. Imbibe magazine covers all aspects of beverages. I’ve found that sugar cubes are superior to loose sugar in that they dissolve faster/better. There went my desire to do any actual work today. For those of us that don’t have good kitchen scales, can someone give a translation into volume measurements? how thoughtless of me. very sorry. have just added. and thanks. Good to see you rockin the Hella Bitters! I am a diehard bourbon lover and I firmly believe that the magic bullet in any mixed bourbon cocktail is always the bitters. Life without bitters is definitely not so sweet! VTR – that’s the cool place that had the little bitters bottles from the Aviation cocktail post, and the one that got me started on making my own bitters. That is one cool bar. I am already starting my Friday cocktail hour having worked my Friday 3rd shift and unwinding with a perfect martini. I just stumbled upon this post after having made the martini and I don’t like to mix, so one more tini and off to bed, and luckily I am writing before the second one, they become more nonsensical after two and hopefully get deleted before I discover my err’s and have to appologize. As for the bourbon, Makers Mark is my standard for the perfect Manhattan with Angostura bitters Carpano vermouth, cherry and an orange twist. It is economical and all the flavors shine through. If I want to pimp it up I will float a little Bookers on top, I find it too hot and too high of proof for a drink on it’s own. My personal favorite is Bakers, right in between the two giants Bookers and Maker’s. My wife’s is Knob Creek, you may want to trust her judgement over mine, as she has much better taste judgement than I do. As for the Old Fashioned, I was corrupted with orange as the go to citrus, it is more complimentary to the bourbon and goes well with the citrus bitters – orange bitters being my preference with this beverage, and a muddled orange slice with a cherry garnish. I know – Whaahhh, wahhh! , but it’s the little things that make it. You could use bottom shelf crap bourbon, but the little little subtle taste differnce in bourbon really do make a differnce, as does the bitters and vermouth, and that little twist of orange and cherry. And not just any cherry, but big meaty juicy Tipsy cherries. This is where a little snobbery is totaly justifed. Don’t fk w/ happy hour! That’s why they call it happy hour! Cheers! And happy frikn Fridays to all!!! A dash of water in there often helps muddle the sugar, and can slightly mellow the flavor of whisky. I prefer it, and it is in most bar books this way. I’m with you. Especially if you’re talking about truly good bourbon, like Noah’s Mill or Rowan Creek. Step away from the add-ons! totally agree. I enjoy good bourbon with one ice cube. on the other hand a ton of bitters and sugar and orange lemon and cherry go along way to dressing up well bourbon (which when I’m feeling financially pinched, and therefore especially thirsty it what I commonly turn to). I disagree on the simple syrup. Using sugar or sugar cubes can make the drink grainy and unpleasant on the palate. Simple syrup alleviates that issue. i don’t disagree, but i don’t keep simple syrup on hand, and this is easier. parsons calls for ss in his book. I love Old Fashioneds, grew up with brandy but I’ll take the combo of sweet and bitter any way I can get it. And I love it with a little orange, reminds me of childhood. Sweet, tipsy childhood. Don Drapper’s drink of choice. Can’t go wrong with that! I love an Old Fashioned when it is made with rye. Bourbon does not give the right note. I think I am allergic to something in bitters 🙁 whichever ones I try I get a rash on the inside of my mouth. I even bought the Hella’s Bitters on your recommendation and it still happened. Weights and Measures: The scales are good for controlled substances, but booze has historically been a fluid(volume) measurement. When we drag out the scale to get a buzz…we will start arguing the merits of metric vs avoir du poids and soon need a calculator. agree on the whole, but for the martini, the 90:18 gram is perfection and can measure right there on the scale, jiggerless. For the record, each and every cocktail at the VTR is built on a digital scale since 2007. By the drop and by gram. so how man drops = a dash? I too love this cocktail. In mine, I add a bit of orange zest to the muddle. It goes well with the bourbon, and makes me happy. Great post, Michael. As always, thank you and keep up the great work! I use a brown sugar cube. Saturate with orange bitters, muddle, add two ounces of bourbon or rye, several ice cubes, and a big fat twist of orange rind. Sometimes I’ll toast the rind a little over a match. hmmm…I’ve never had one. go figure. I generally jrink my bourbon on the wrocks. a triple is a perfect nitecap. the trouble starts when you pour yourself yet “another” nitecap. I’m open minded as far as the variety of brands and flavors goes…make it with whatever you like most. But when it comes to choosing the ice and the glass…hello drink snob. They both have to be big; a double old fashioned glass needs 4oz of bourbon (so do you) andy one big ice cube melts slowly enough not to dilute too much. Amazon, Target and Williams Sonoma have the oversized cube trays you need. I prefer a ‘Muddled Old Fasion’. Sugar and bitters, orange and a cherry. Muddle everything, then add ice and club soda. Finally lots of ‘Makers Mark’. paulius of VTR suggests this version as well so youre in good company. Rye all the way. I buy it by the case as it is sometimes hard to find. Always have some on hand for Old Fashioneds or Sazeracs. Thanks for posting this recipe. Sipping one now after being inspired by your post. Great piece and fun drink to play with. If you want to get real geeky on the syrup vs. cube vs. loose sugar question- you may want to use demerara sugar syrup. The demerara sugar would be more similar to what was used when the drink was first developed. It has a slightly deeper,smokier flavor that often plays well with the bitters. (Orange bitters for me, please). What I really like about the Old Fashioned is how the cocktail changes as the ice melts, not quite like a wine opening up, but a akin to adding some spring water to single malt. I always find there’s a point about halfway through an OF where everything is perfectly balanced. It’s there for a moment…then gone, which of course just makes you want to have another! The drink in the photo looks like more liquid than only 2 oz + a tsp worth–barely more than 1/4c. Is that really all there is in that photo? I’m just happy its the week before the Kentucky Derby and somebody is talking about a bourbon cocktail OTHER than the mint julep! Around Lexington, KY, the muddled Old Fashioned is definitely the favorite, most often utilizing homemade bourbon soaked cherries. Have you ever considered creating an ebook or guest authoring on other sites? I have a blog centered on the same topics you discuss and would love to have you share some stories/information. I know my viewers would enjoy your work. If you are even remotely interested, feel free to send me an e-mail. What are you stating, man? I know everyones got their own viewpoint, but really? Listen, your web log is interesting. I like the effort you put into it, specially with the vids and the pics. But, come on. Theres gotta be a better way to say this, a way that doesnt make it seem like most people here is stupid! Hi I like your wewebsite. Do you need to guest post in my very own at some point? If that’s the case make sure you tell me by way of email or simply answer this opinion simply due to the fact My partner and my spouse and i actually signed up for announcements and can understand if you do. Soon after study some while using blogs for ones site currently, we genuinely as though your way of blogging. I bookmarked it to my save internet website list and you will be checking out back shortly. Pls think about my internet website also and inform me that which you consider. Rattling fantastic visual appeal on this website Aguero rallies Atletico pertaining to Europa success | little league stars information blog I might rate it 10 10. Many thanks for creating the effort to talk about this, I feel strongly about this and enjoy studying a great deal more on this topic. If feasible, as you gain knowledge, would you mind updating your weblog with a great deal more details? It’s very useful for me. Howdy. Very cool site!! Man .. Excellent .. Superb .. I will bookmark your blog and take the feeds additionally…I am happy to find numerous useful info right here within the post. Thanks for sharing. Hey There. I found out your weblog the usage of msn. That can be a really perfectly written write-up. I will be sure you bookmark this and return to read extra of your helpful data. Thank you for your post. I’ll undoubtedly comeback. You should chip in projector bout forth partnered regarding the best blogs on the ball lacing. alter ego will power boost this site! Hi presently there, i read your website occasionally as well as i own an identical one and i has been just wondering if you get a lot of spam responses? If so how will you prevent the idea, any plugin or what you can propose? I get so much lately it can be driving me personally crazy so any help is quite much loved. Usually My partner and i wouldn’t release on websites, on another hand would like to state that this type of publish actually forced us to do this. Very nice post! U set up some decent pts in this article. Ive looked on the internet 4 dis & found many people will consent together with your pt associated with view. Thank you for submitting this article. This really is information I’ve been seeking for. Iâ€™ve been hoping to discover clear and concise content like yours. Your exclusive points helped me think about this data differently. I just want to say I am just new to blogging and absolutely savored your page. Very likely I’m want to bookmark your blog . You actually have excellent articles and reviews. Cheers for revealing your web-site. Quite informative post. Your current Website style is awesome as properly! Do you mind if I quote a few of your posts as long as I provide credit and sources back to your website? My blog is in the exact same area of interest as yours and my users would truly benefit from some of the information you present here. Please let me know if this okay with you. Regards! My RSS cannot conditional on be ashamed on in search something latest on your weblog. I reading your blog from the start, and seize to take on, it’s complete of the greatest i eternally read. If you last will and testament call on for any refrain from, contribute up me a sign.